Set the planner to use for repairing experience paths inside the LightningRetrieveRepair planner. If the planner is not set, a default planner is set. 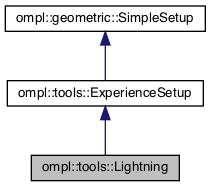 Definition at line 98 of file Lightning.h. Definition at line 49 of file Lightning.cpp. Definition at line 436 of file Lightning.cpp. Definition at line 443 of file Lightning.cpp.